Help : The Accounting Schema Window defines an accounting method and the elements that will comprise an account structure. 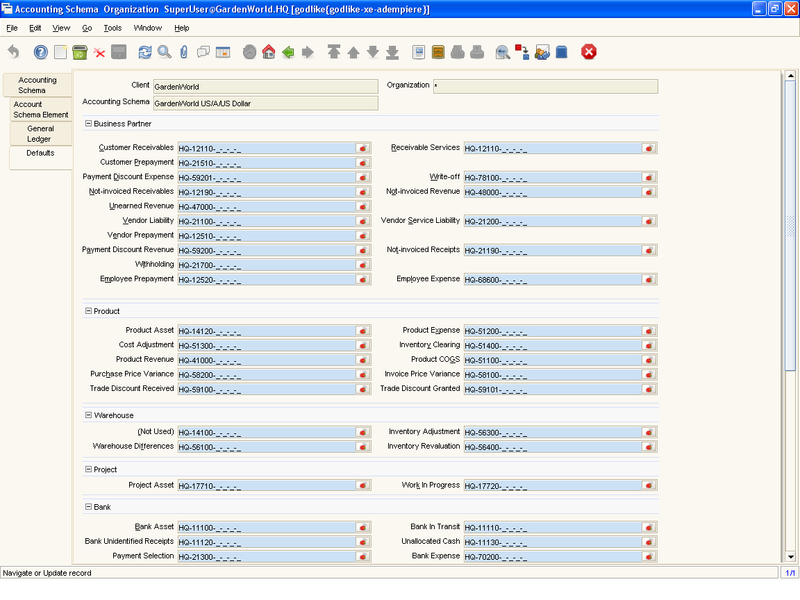 Create and activate elements for detailed accounting for Business Partners, Products, Locations, etc. Review and change the GL and Default accounts. The actual accounts used in transactions depend on the executing organization; Most of the information is derived from the context. Help : The Accounting Schema Tab defines the controls used for accounting. 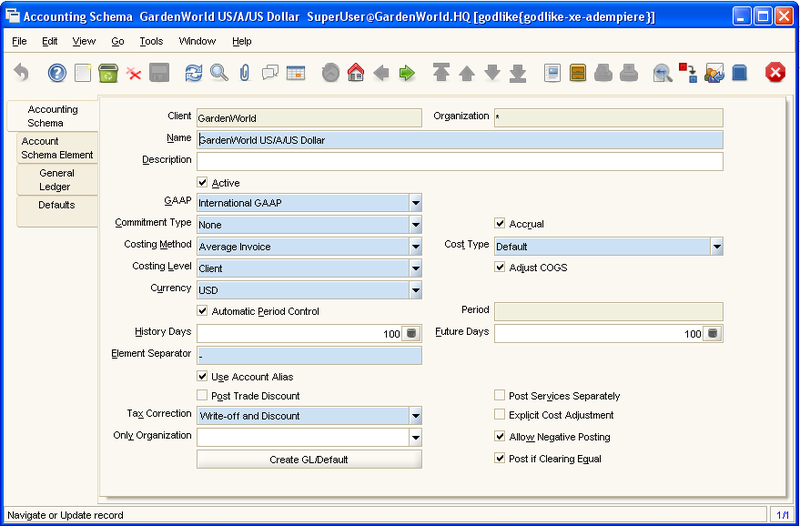 You can define multiple accounting schema per client (for parallel accounting). Postings are generated for an accounting schema, if the schema is valid and you have defined GL and Default accounts and after completion of the Add / Copy Accounts process. Post Trade Discount Generate postings for trade discounts If the invoice is based on an item with a list price, the amount based on the list price and the discount is posted instead of the net amount. Example: Quantity 10 - List Price: 20 - Actual Price: 17 If selected for a sales invoice 200 is posted to Product Revenue and 30 to Discount Granted - rather than 170 to Product Revenue. The same applies to vendor invoices. 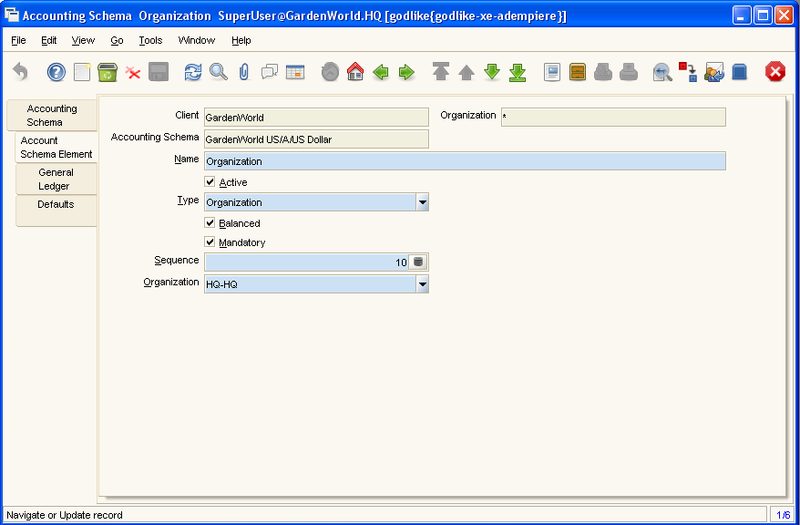 Help : The Account Schema Element Tab defines the elements that comprise the account key. A name is defined which will display in documents. Also the order of the elements and if they are balanced and mandatory are indicated. Help : The General Ledger Tab defines error and balance handling to use as well as the necessary accounts for posting to General Ledger. Help : The Defaults Tab displays the Default accounts for an Accounting Schema. These values will display when a new document is opened. The user can override these defaults within the document. This page was last modified on 8 September 2009, at 19:51.